What makes our Charging Carts and Charging Cabinets such great values is that they support the devices you’re using right now, and they will support your next set of devices, and the next, and the ones after that. Mix and match Laptops, Chromebooks and Ultrabooks with tablets, eReaders and Handhelds. It’s completely up to you. IT & budget friendly with intuitive cable routing. Our Yes Basic Charging Cart is economical, durable and flexible. Charge, store and transport up to 36 mini-laptops and tablets. One size fits all! All device shapes and sizes with screens up to 13″ and some up to 14″ will fit this cart, with and without cases. Mix and match Chromebooks, MacBooks and Surface Pros with iPads, e-Readers and handhelds. It’s completely up to you. A simple power management system safely charges all your devices and sends a single cord to the wall. The heavy duty steel construction provides durability and security. Wouldn’t it be great if you could keep the same tablet charging cart for years, long after your first generation of tablets? You can with our Tablet Charging Cart for iPads & Tablets. Its shelves shift up & down, its bay dividers move side to side. You’ll be able to fit tablet devices of all shapes & sizes in this innovative cart. You get to decide how it’s organized! Ships Assembled ready for use. • Charge and store 16 – 20 devices. • Wall mounted Cabinet saves space in crowded classrooms. 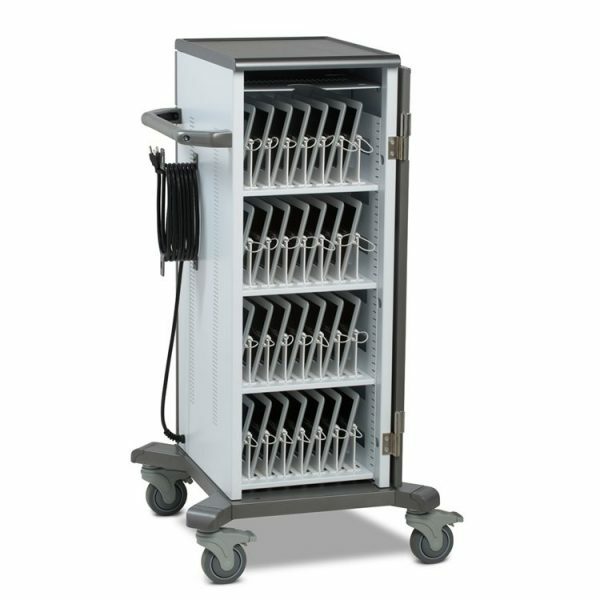 Our the up to 20 Unit Charging Cart for Mini Laptops, is flexible, use it to store and charge just Chromebooks or mix and match with Tablets, eReaders, Handhelds and Smart Phones. Adjust the width of bays and height of shelves to fit any device in any case. Ships Assembled ready for use. More details below. Charging Carts LIFETIME WARRANTY – ASSEMBLED – MADE IN THE USA! With our Mini Laptop Charging Cart, one size fits all Chromebooks up to 13” screen – and even some 14”! Set the cart’s bay width and shelf height for your device, then reconfigure when it’s time for new devices. Mix and match with tablets, eReaders, and handhelds for even more flexibility. All this in a space saving footprint and a Lifetime Warranty. Ships Assembled ready for use. More details & video demos below. Featuring patented Power Shuttle® power management technology, the system that efficiently charges up to 40% faster than a standard round robin system. With just one power cord plugged into a standard wall outlet, it safely prevents overloading of electrical circuits by automatically determining the maximum number of devices that can be charged at one time. YES12 Cabinet for Mini Laptops: Lots of laptops, limited space? Store and charge up to 12 devices with the wall mountable YES Cabinet for Mini Laptops! One size fits all Chromebooks, Surface Pro 3 and other mini laptops. Set the cabinet’s bay width and shelf height for your devices, then reconfigure when it’s time for new devices. Mix and match mini laptops, tablets, and handhelds for even more flexibility. Quantity Discount Available – Ships Assembled! Our Economy Tablet Charging Cart is an attractive, durable and affordable way to charge and store your tablet and mini laptop devices. This locking steel and wood cart has eight horizontal shelves that hold up to two tablets each. Includes two eight outlet power strips. Access and load tablets with the two locking front doors, the back features a smaller locking door for quick access to cords and includes cable management clips. Roll the cart anywhere with the 3″ casters, two locking. 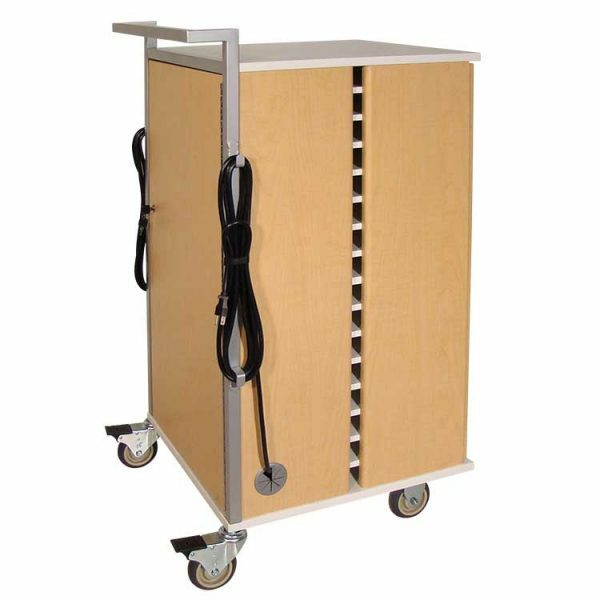 This Balt Economy Tablet Charging Cart is TAA compliant and comes backed by a one year warranty. 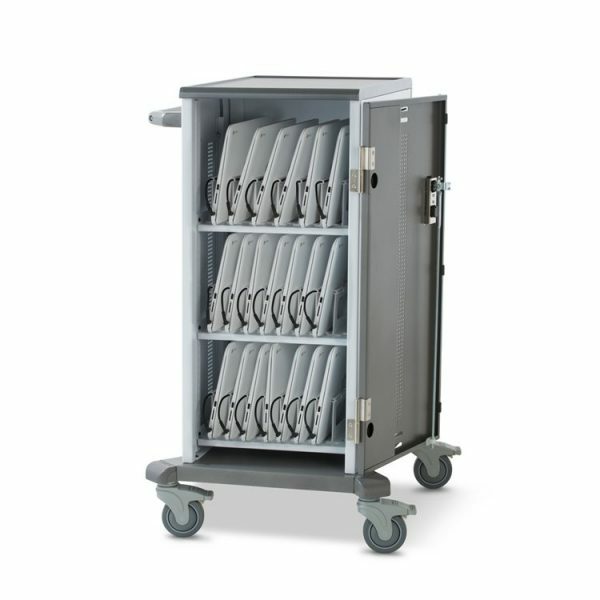 Our Laptop Charging Cart 20 Unit, safely Charges, Locks, and Transports Laptops. Bays are 15.5”w x 12”d x 3”h. Keyed 2 Point Locks, Large 5” Casters. Lifetime Warranty on Cabinet, 1 year on Electrical. Tested to UL Standard 60950. Comes in Silver Metallic (SM) with Shelves and Handles in White (WH). Weight: 240 Lbs. See more below. 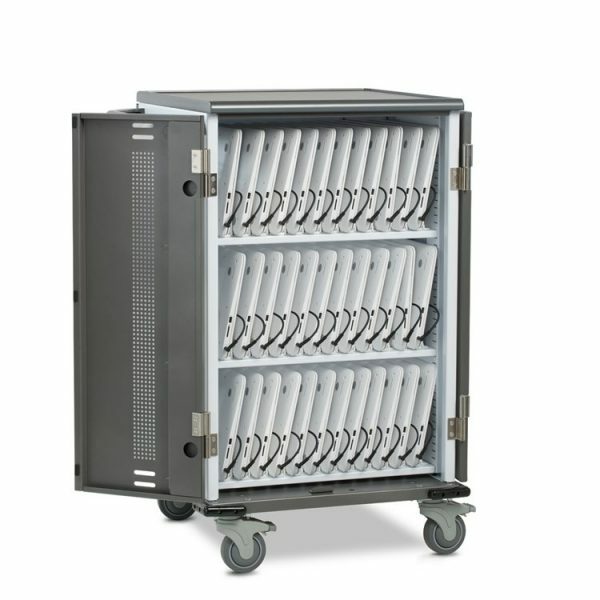 Our Laptop Charging Cart 30 Unit safely Charges, Locks, and Transports Laptops. Bays are 16”w x 12”d x 3”h. Keyed two Point Locks, Large 5” Casters. Lifetime Warranty on Cabinet, One Year on Electrical. Tested to UL Standard 60950. Ideal Solution for Charging and Securing 30 Laptop Computers. Ships Fully Assembled, Powered Ready to Wheel In, Load and Go! Tech Tubs for iPads, Lock, Charge, Sync, it really is that simple. Tech Tub for iPads is a compact solution designed to support various mobile devices. Made from highly durable, heat resistant ABS plastic and vented to ensure airflow, Tech Tubs are secure, mobile and lightweight. Tech Tubs support a “grow your technology” approach to purchasing. Tech Tubs for ChromeBooks, Lock, Charge, Sync, it really is that simple. We have improved our best selling Tech Tub with new features like adjustable dividers for different sized devices and a cable management channel to keep cords neat and organized. Tech Tub for Chromebooks has been designed with a taller lid to accommodate a wider range of Chromebooks. Tech Tubs are secure, mobile and lightweight, and make device sharing and charging easy. Tech Tub for ChromeBooks is a charging solution designed to support and secure various mobile devices. Made from highly durable, heat resistant ABS plastic and vented to ensure airflow, Tech Tubs are secure, mobile and lightweight. Tech Tubs support a “grow your technology” approach to purchasing. Tech Tub Trolley for iPads & ChromeBooks, Lock, Charge, Sync, it really is that simple. Tech Tub Trolley is an ideal solution for transporting small quantities of devices from one location to another. Made from highly durable, heat resistant ABS plastic and vented to ensure airflow, Tech Tubs are secure, mobile and lightweight. Tech Tubs support a “grow your technology” approach to purchasing. Tech Tub Cart for iPads & ChromeBooks, Lock, Charge, Sync, it really is that simple. Tech Tub Cart is an ideal solution for transporting mobile devices from one location to another. It’s also a secure central resource for storing tech devices. Made from highly durable, heat resistant ABS plastic and vented to ensure airflow, Tech Tubs are secure, mobile and lightweight. Tech Tubs support a “grow your technology” approach to purchasing. Each Tech Tub Cart included 4 Charging Tubs for your iPads or Chromebooks! Tech Cart for iPads, ChromeBooks and other Devices. 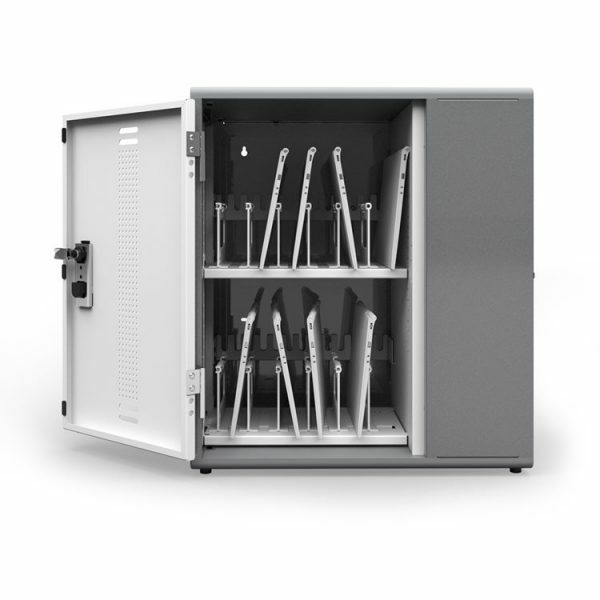 The Tech Cart for devices can safely store and charge up to 7 iPads, ChromeBooks and other devices. It is a highly mobile solution where students can easily access their devices and headphones without the need for adult assistance. 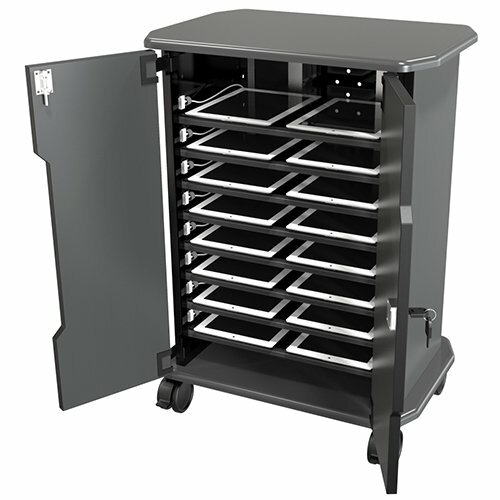 The Tablet – ChromeBook Cart Design saves valuable floor space in your classroom, business, computer lab or library. Mix and match devices of any make and model in a compact footprint, works great as an iPad Charging Cart. Separate locking IT area protects chargers. Ships Assembled ready for use. Standard Cart bays measure 10″w x 1.8″h x 14″d. The ultimate use of space & budget. The Evolutions Tablet Charging Desk is a Desk & Tablet Charging Station in one, sleek design. The 30″d x 60″w Tablet Charging Desk is designed specifically to function as a standard desk with the added benefit to store, charge and secure your Tablets and Chromebooks. Our generous shelf size stores your Tablets and Chromebooks, with or without a case. Attractive, matching, metal cable trough catches all excess cords. The desks’ unique design makes it easy to access your Tablets.